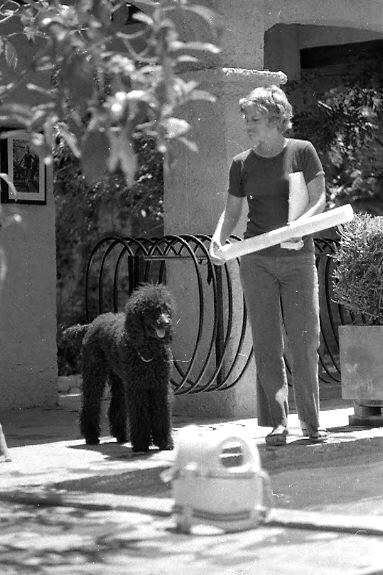 Molly Duane Heneghan (now Molly Leland) is an artist and graphic designer whose husband, George Heneghan, the architect of the Danza del Sol hotel in Ajijic, was the subject of a previous post. Molly Heneghan was born into a society family in 1942. She graduated from Concord Academy in Concord, Massachusetts and attended Manhattanville College where she majored in art history and gained a teaching qualification. She then taught in Aspen, Colorado, where she first met her husband. The Heneghans lived in Aspen for several years with their two young sons – Eric and Adam – before visiting Ajijic for the first time in December 1970. The liked it so much that they decided to make it their base for several years. Molly and the children lived in Ajijic from mid-1971 to 1975. Husband George commuted back and forth to Aspen for the first six months before opting for full-time residence at Lake Chapala. Molly Heneghan. 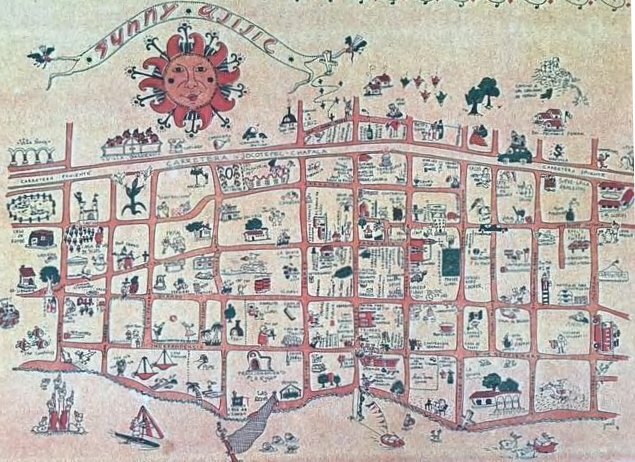 Map entitled “Sunny Ajijic”, ca 1973. Molly Heneghan’s graphic map-poster of Ajijic, entitled “Sunny Ajijic”, with its wealth of details of the location of individual stores and services, is a valuable social history document today, and is almost certainly the earliest document of its kind. It was printed in the U.S. and first went on sale in about 1973. When the Heneghans left Ajijic in 1975, the remaining copies of the map were left on consignment at Gail Michaels‘ store – Bazar El Angel – which was located near the (Old) Posada Ajijic. Molly Heneghan, Ajijic, ca 1972. Photo by Beverly Johnson. (Reproduced by kind permission of Tamara Janúz). During their time in Ajijic, the Heneghans were very active in community events, especially the Lakeside Little Theater. They and their children became very good friends of many of the notable artists and authors in the area, including Beverly Johnson and her family, Gerda and James (“Jim”) Kelly, Lorenzo Semple Jr. and his family, and with Allyn Hunt and his wife, Beverly. My sincere thanks to Molly Leland for sharing memories of her time with her family in Mexico. I am also grateful to Tamara Janúz for permission to reproduce the photograph taken by her mother, Beverly Johnson. Guadalajara Reporter: 8 May 1971; 22 Sep 1973; 29 Nov 1975.